Start your review of Monica Townsend. Send a message to Monica Townsend. Thank You! Your message has been sent to Monica Townsend at Sherwood Ford. "Great experience and great customer service"
Had a great experience from start to finish. I built exactly what I wanted online, then Monica contacted me saying she was on it. Took less than a week from start to finish to get me into my new Explorer. It was the best and easiest experience buying a car. I highly recommend Sherwood Ford, and totally recommend Monica. "Quick and Painless Car Shopping Experience!" Go visit Monica! I came in looking for a low km all wheel drive vehicle and Monica hooked me up! No pressure at all:) Thank you Sherwood Ford. "enjoyable experience no stress "
"Got me exactly what I wanted "
My first Ford. My sales rep contacted me as a result of my online enquirers. Very knowledgeable on product and options. She worked with me to get me exactly what I wanted. From trim package, trade / no trade options, and out of province delivery options. Thanks Monica and Sherwood Ford. I was very impressed with the facility, very nice. My shopping experience went very well and I’m very happy with the result. Monica was very knowledgeable but wasn’t pushy. I will definitely recommend the dealership to others and return in the future. Haelee was great to deal with also! "Low pressure and friendly car buying experience"
I purchased my car at this dealership and, to my delight, it was the exact opposite of my last car-buying experience at Go Auto. (I found Go Auto to be high pressure, uncomfortable and not at all enjoyable.) 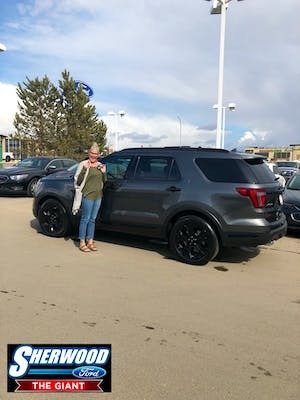 Throughout my three visits to Sherwood Ford, Monica was friendly and helpful in getting me into the vehicle I needed. She was an excellent listener, and kept in touch with me just the right amount. Even though I was downgrading my vehicle, Monica made it easier because she was patient and respectful. I hope that when I upgrade my vehicle in the future, she will still be working there. "Looking for a new F150"
I contacted the dealership through email and received a response within 24 hours. Monica was very upfront and provided me with the necessary information that I needed before setting foot at the dealership. I did not purchase a truck this time but hope to hear from Monica and the dealership if anything comes up that would fit my needs. "Out of province vehicle purchase." Very friendly and knowledgable staff, made this purchase so effortless.the staff operate like a well oiled machine from reception, to sales, to finance department. I highly recommend sherwood ford. Thank you so very much. 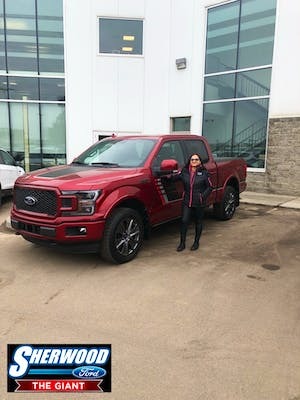 We bought a new 2018 F150 at Sherwood Ford with all the options we were looking for. 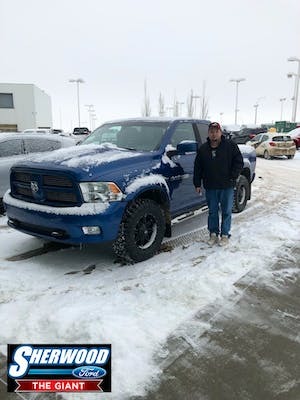 We love our new truck and Sherwood Ford was excellent to work with.